(Sorry for my very bad English!) My joystick, which I have been using for 2 years, is acting drunk and doesn't seem know what controls are what. 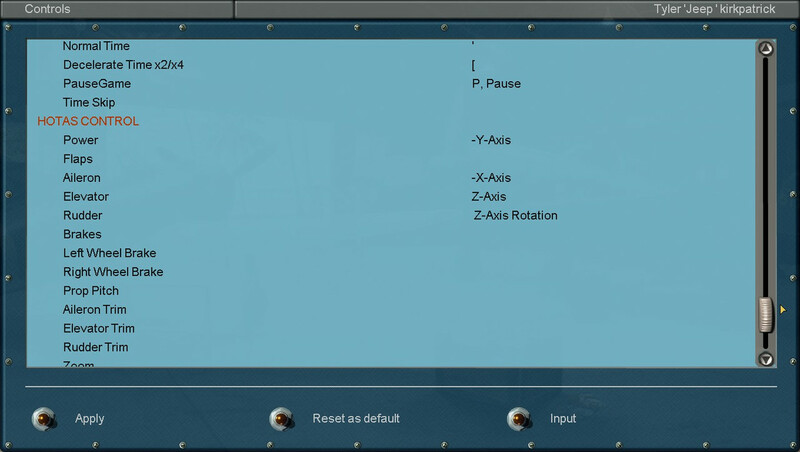 In my control tab, it says all the controls are correct (Throttle uses throttle ex,) but In game, The throttle is controlling upward, rudder is controlling throttle. Changing the control is doing nothing as the controls don't actually change when I try. Do I need a new flight stick? Thanks! Not surre if I'm helping but just had a similar problem last night..windows 10 - 4.12.2 with VP Modpack.. I re-calibrated ( reset ) the device in windows - had to re-start the game a couple times..then Voila! I remember - once where I had to unplug it, then plug it in to get the performance back. I'd changed the controls and settings for another plane. Windows give a number to your joystick (ex : device 1) and your throttle (device 2). This number is used by the game to recognised every device. Sometime windows change the device number but IL2 is not able to detect it so your throttle (now device 1) is the joystick for your game and vice-versa. For Thrustmaster products you can use Target, so all you usb device will be considered as only one device.